That's worth £300 of anyone's money, right? Right? 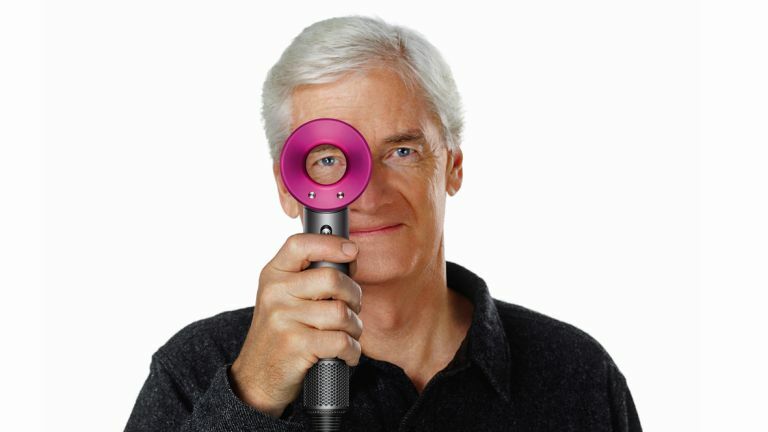 Dyson Supersonic has been built to do for hairdryers what its fans and vacuum cleaners did. It's meant to change the way you blow dry your hair. In fact, if you wanted to explain the Supersonic in the simplest terms possible, you might call it a handheld, miniature version of its Hot/Cold fans as it utilises its bladeless fan Air Multiplier tech. As you can see, the Dyson Supersonic employs all the brand's usual design language in terms of appearance and colour palette (we’ve got the pink and white version, but it also comes in silver). The Supersonic is the result of 600 prototypes and £50 million in R&D, and it costs around £300, which is way more than any other hair dryer on the market. Dyson crows that the Supersonic is, 'up to eight times faster' than the current top-selling hair dryers in Japan (the country has a huge market for hair-styling tech, relative to its size), 'and half the weight'. Not only that but it virtually halved the drying time compared to my standard, rather cumbersome version. The Supersonic is simple to use; the controls are too small and arguably too numerous, but you soon get the hang of them and, more importantly, they engage with an ever-so-satisfying click. Mmmph. On the head, you have the temperature up/down controls. There are four heat settings and one for cool air only. On the handle, there’s the on/off switch and a cool blast button for instant bursts of cold air, for setting styles. Is it really 'eight times faster'? Well, no. But it did provide us with a significant improvement. Half an hour after a shower it would normally take me six minutes to fully dry my already towel-dried locks. With the Dyson it look 3.5 minutes. That’s some going when my hair has always been infuriatingly thick. I must have wasted days, or even weeks throughout my life drying my hair. So this is literally a breath of fresh air, pun intended. The jet of air is beyond powerful, so you may need a low setting for fine hair. Similarly the attachments are magnetic, so gone are the days of wrestling with a screw fixing. The range of extras- smoothing nozzles of various aperture sizes, diffusers, et al remain cool to the touch, thanks to Heat Shield tech. It also doesn't make a huge amount of noise for such a powerful thing. That's due to clever acoustic engineering and because (deep breath): ‘An axial flow impeller inside the motor… simplifies the pathway of the air, reducing turbulence and swirling. And by giving the motor impeller 13 blades instead of the usual 11, Dyson engineers pushed one tone within the motor to a sound frequency beyond the audible range for humans.' Well yes. It seems obvious when they put it like that. The handle is easy to hold and it is actually pretty light - no more achy arms! The cable will never tangle and hardly takes up any room. There’s even a heat mat, to protect your dressing table, which is probably slightly excessive as it hardly gets hot on the outside at all, but it’s still great for gripping onto a worktop. There are no vents to get clogged with fluff. The only thing we can think of that will eventually kill the Supersonic is motor burnout – but that’s clearly going to be a long, long way off. There’s been a lot of hype about the Supersonic - everyone we spoke to wanted to have a go and it’s a rare product that brings genuine innovation to an established category. The best thing about this hairdryer is the way it makes my hair feel once I’ve used it- full, silky and smooth. It really does feel like a hairdresser has been at work. Of course, Dyson's innovations seldom come cheap, and the Supersonic is very much at the premium end of the dryer market - there's also a fully pro version for stylists and hairdressers. Indeed, a brief perusal of Amazon and John Lewis brings up zero rival products in its ballpark, price-wise. Even so, we wouldn't bet against Dyson and it’s lightweight, high-powered Thor's hammer of a hair dryer. Everyone wants one, and why not?